At Save Our Heroes we understand injustices occur within the military justice system (UMCJ). We also understand working with Congress is the best way to reduce the systemic problems that propagate injustices which result in wrongful convictions and miscarriages of justice. Save Our Heroes makes monthly visits to Washington, DC to help educate Congressional leadership on inherent flaws within the military judicial system. Congressional changes are paramount not only for justice, but National Security. Save Our Heroes’ visits Capitol Hill and make legislative UCMJ recommendations to legislators. The Save Our Heroes’ (SOH) legislative team made three trips to Capitol Hill during November suggesting changes for improving the UCMJ process. The SOH legislative suggestions of creating a Conviction Integrity Unit, eliminating the Special Victims Counsel position, and requiring ten Senators or more to stop a General Officer nomination were all discussed. The SOH visits were focused on key offices within the Senate. All the discussions were engaging and encouraging to our team. During our conversations it was obvious SOH is not the only organization concerned about the direction of the military justice system. 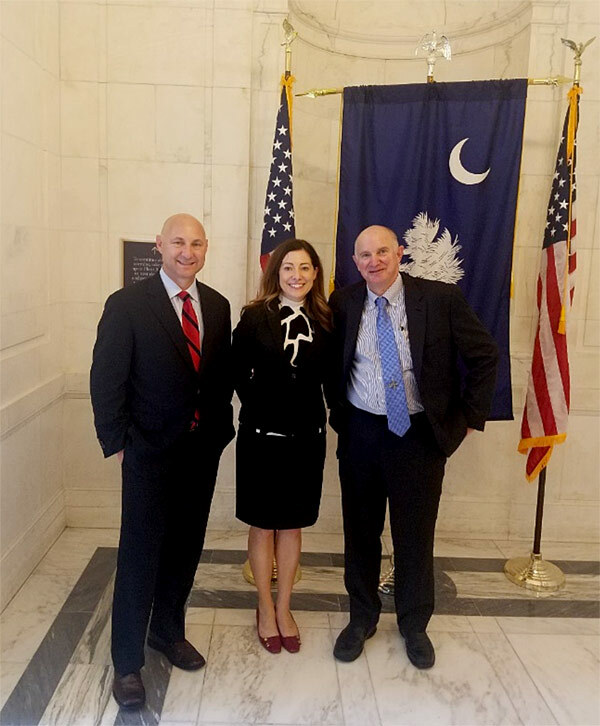 Arnie Dale, SOH Treasurer, Leanne Dale, SOH Legal Director, and Doug James, SOH President, during a November 2018 Capitol Hill Trip. Save Our Heroes made three trips to DC in November and over eight total trips in 2018 fighting for Legislative change to a politically influenced military justice system. The SOH legislative proposals discussed with key Senate offices are shown below. SOH would love your feedback, but more importantly let your Congressional delegation know. We need to get these changes made as soon as possible before more damage is done to our military. This Congressionally directed position (from the 2014 NDAA), is a government lawyer assigned only to advocate for the alleged victim. Unfortunately, the SVC, with no equivalency in the federal system, has introduced numerous problems into the military justice system. There are no legal guidelines so military judges have wide latitude on SVC use which has resulted in a breakdown in basic trial procedures. For instance, the SVC can argue during the trial, adding complexity and confusion during proceedings. However, the most egregious example of how the SVC’s position causes divergence from constitutional norms its unintended consequence of is setting up ‘Brady’ violations. The SVC position creates potential ‘Brady’ violations as everything the alleged victim tells or shows to the SVC would be privileged and held in confidence due to the attorney client relationship. The SVC does not have to comply with the same rules as the prosecutor and does not have any duty to turn over exculpatory evidence. This creates a ‘Brady’ violation and the resulting tainted trial. Currently, only one Senator vote is required to stop a GO promotion. This political threat to a GO’s career has become weaponized in today’s Senate. For example, in 2013, Lt Gen Helms’, a highly decorated USAF Astronaut, nomination was held and ultimately withdrawn because of an individual Senator’s belief Lt. Gen Helms was incorrect in her decision to overturn a Court Martial decision. Lt. Gen Helms’ decision was a normal part of the military justice process, but one Senator chose to unlawfully inject their belief into the system. This Senator’s UCI has now disrupted the decision calculus of all of today’s military Convening Authorities. This Congressional threat was echoed in a recent appellate court decision in the U.S. vs Barry case. The Court of Appeal for the Armed Forces (CAAF) ruled the Convening Authority was unlawfully influenced by the Senate and others. Chief Barry, a highly decorated Navy Seal was incarcerated due to this internal threat for over a year until the system’s corruption could be revealed. These are only two examples of how the fear of jeopardizing one’s career in the military is a powerful weapon and has been leveraged against many exceptional officers. SOH has many more examples of our military’s exceptional senior leaders being sacrificed for political gain. There is a clear and convincing need for the formation of a military Conviction Integrity Unit (CIU). A CIU which must be free of political or special interest group interest. Forming a CIU in prosecutor’s offices is trending throughout the country because of the sharp increase of wrongful convictions. Many CIUs are created in medium to large sized district attorneys’ offices. Models and best practices have been developed to not only review potential wrongful convictions, but also to develop best practices to prevent wrongful convictions. Model policies are found within many civilian prosecutor offices. In addition, to support the idea of a CIU there are law reviews describing model policies and protocols for the fair and equal administration of justice. SOH admits there are significant challenges to the reform of the military justice system, but common-sense solutions are available. Forming a military CIU, can help mitigate and reverse many of the wrongs that have already occurred. More importantly it will hold those accountable for propagating a politically influenced system. Save Our Heroes’ welcomes comments from our readers for other suggestions for legislative change proposals.